Fairhope, Alabama (CNN) -- Bob Pope zips along the two-lane highway, among the swooping giant oaks draped in Spanish moss that line Alabama's Gulf coast. It's a journey he's taken hundreds of times over the past three decades. He's hoping this won't be his last. Today, he's soaking everything in. His lipstick-red Chevy SSR slows as he comes up on a canal. He admires a giant beast of an alligator. He has seen it grow from just a small gator to more than 15 feet long during his drives over the years. The gator's mouth is wide open as it bathes in the sun. A grin seems to spread across its face. Pope presses on. With the oil slick looming in the Gulf, he can't help but wonder: Will the gator be alive by summer's end? Will my seafood restaurant still be in business? All around, there are signs of the last major disaster that wreaked havoc, when Hurricane Katrina smashed into the coast. Five years later, there are stretches along Mobile Bay where every third lot is vacant, where houses stood before Katrina. Video: Can oil and coastal towns co-exist? Video: Crude cleanup stymied, what next? "See there," Pope says, pointing to a slab of broken concrete along the water's edge. "That was a nice restaurant." Pope's own restaurant, the Yardarm, was knocked out for more than a year by Katrina. People here take hurricanes on the chin. Everyone rallies together, people unite, and most everyone rebuilds. But this oil slick is different. People's entire livelihoods are at stake, as well as the fish in the Gulf. "With hurricanes, we know what to expect," Pope says. "They're either gonna be bad or worse, tear you up a little bit and go again. This can go any which way." Pope sometimes jokes that his restaurant -- a local landmark that employs three generations of his family, including his 83-year-old mother -- may become a pizza joint by summer's end. He notes that they also serve a mean chicken. He says it with sarcasm, but it also stings. Everyone, he says, is waiting to see whether the oil slick ends up being an irritant to the community or "a devastating glob of something that just kills the area." "I'm gonna be optimistic," he says, "until shown otherwise." On this day, Pope needs oysters, crab claws and shrimp to get him through the next three weeks, before the entire region could be out of seafood. He prides himself on serving fresh catches from the Gulf of Mexico. Workers in Bayou La Batre, Alabama, clean crab at one of the local shops where seafood is running low. He's made the 40-mile journey to Bayou La Batre, a village known as the "Fishing Capital of Alabama." Pope's suppliers tipped him off: We've got everything you need, but you gotta get here fast. Oyster shells crunch under Pope's feet as he makes his way through the parking lot of Anna's Seafood. Inside, about two dozen workers, many of them women from Southeast Asia, shuck oysters at breakneck speed. Their hands move so fast, you can't even see them. They get paid by the pound. 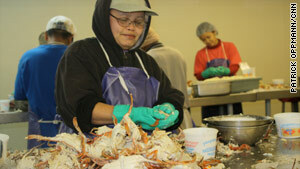 Pope says some of the seafood workers are Cambodian; others are Vietnamese. They all recognize him. He gives one older woman a kiss on the cheek. She breaks for exactly three seconds to smile and then goes back to shucking. The seafood business, Pope says later, is like one big family. Everyone knows everyone, and he loves being a part of it. Richard Harbison takes the check that Pope gives him for the gallons of oysters being loaded in his car and looks at it for a while like he may not be seeing too many more. "We are like the last gas station in town with any fuel," Harbison says, "but we are running out." We take a whipping every once in a while here, and you just have to brush yourself off. Just down the road is what locals claim is the largest pile of shucked oyster shells in the world. It's several stories high and circled by a swarm of sea gulls. The stench of raw fish permeates everything. At the final stop, Darrell Graham -- a man as big as some of the nearby shrimp boats -- has his feet propped up on the counter. Graham is on the phone, telling an out-of-towner that he has no more shrimp. "I'm totally out. I've got nothing left," Graham says. He hangs up the phone and glances up at Pope. "Do you have any for me?" Pope asks. Pope asks for two boxes of large shrimp. Graham squints like it hurts and tells a worker to "scrape it together." "Get Bob those two boxes," he hollers. On Graham's lap is a cat named Puss who rode out Katrina in the rafters of the warehouse. Over the door, about 8 feet up, is a line drawn in marker. Just above the line, it says, "Katrina." That was how high the water got. It's another reminder of the last disaster -- as well a sign of the the region's ability to rebound. The Yardarm has been in business for nearly 37 years. It's on the public pier in Fairhope, a quaint town on the eastern shore of Mobile Bay. 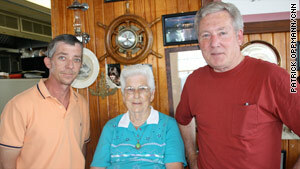 Bob Pope, far right, works at the Yardarm Restaurant with his mother, Dorothy, and nephew, Adam. Pope doesn't advertise. He operates by word of mouth. Everyone around here knows the Yardarm. Black-and-white photos of fish and crab adorn the walls. Like in any good Southern joint, fried food is the Yardarm's specialty. But Pope admits that he's adapted in recent years, allowing healthier broiled selections on the menu. With the slick nearing, customers have already come in asking whether it's still safe to eat seafood. Pope has returned from his trip with a massive load of oysters, shrimp and crab. His mom, Dorothy Pope, has been working at her son's side for the past 35 years. She helps rearrange and stack the boxes of seafood in the freezer but can't make it all fit. She'll have to store some at the house. "We'll have a hurricane now," she says with a laugh, "and lose power." Bob Pope's nephew, Adam Pope, cooks and waits tables with his wife at the Yardarm. The oil slick is weighing heavily on them. They've begun contemplating moving, although they hope not to take such a drastic measure. "Our children," Adam Pope says, "they'll be our age before they see anything come back in the Bay." It's on everyone's mind in the community, but especially here among the walls of the wood-paneled restaurant. Will tourists avoid the region altogether? Can seafood survive without being contaminated? Bob Pope isn't about to give in. He's hunkered down for the long haul. "This is what we're good at," he says. "We take a whipping every once in a while here, and you just have to brush yourself off and come back and hit it again."